Below are five home upgrades that not only provide the owner with immediate joy and function, they also retain a high percentage of value when it comes time to sell. You may find it interesting that all five are practical home upgrades, not exciting additions or renovations. Based on the National Association of REALTORS®’ 2017 Remodeling Impact Report, statistics show that projects influenced by personal preferences and style trends generally have less of a return than those based on necessity. Keep in mind that prices and values depend on your location and home type, and that the costs and returns listed below are national averages. 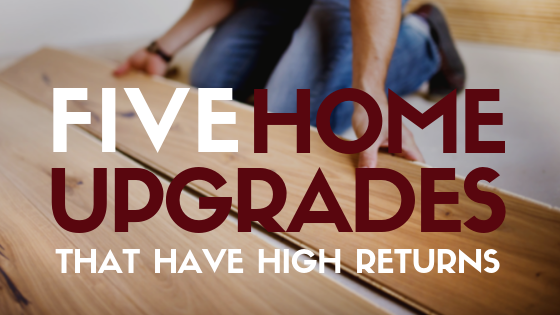 Do you have questions about your home’s value and the impact an upgrade would have on resale? Give me a call! I’m always happy to review your home’s value and equity based on current Atlanta market trends. If you’ve ever had a leak in your roof, you know just how important a sturdy roof can be to your home’s overall functionality. And with an average life of 20 years, it’s no wonder that a new roof has an incredible return of over 100%. While at first a new garage door may seem like an insignificant home update, the relatively low cost paired with huge impact on curb appeal quickly makes it an appealing upgrade. And because of its frequent use, a reliable door with the latest conveniences will attract both you – the owner – as well as future buyers. There’s no denying it, new or refinished floors are an investment. But with a high resale value and an endless list of benefits (easy to clean, reduction in home allergens, and timeless style), they’re always a smart choice when upgrading your home’s interior. Okay, there is nothing exciting about insulation. After all, it’s hard to get excited about spending money on something that ends up hidden behind your walls. But insulation plays a huge part in your home’s overall climate health and functionality – resulting in added home comfort and year round cost savings on your energy bills. Now that’s something both you and a buyer can get excited about. Though you’ll be able to see your new HVAC system, the thought of spending thousands on an HVAC system is discouraging. Thankfully, a new HVAC system not only adds to your home’s overall energy efficiency, it also goes a long way when it comes to your home’s marketability.